Located in the oasis of East Turkestan near the edge of the Taklamakan desert, the Silk Road ran through the oases of Kashgar, Khotan and Yarkand where weaving centers were set up in the 18th century. 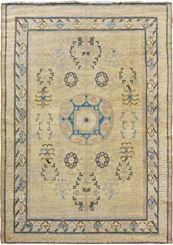 The organized integration of indigenous motifs and abstract elements of Chinese origin, characterizes the uniquity of East Turkestan rugs. 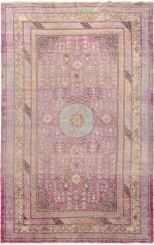 The rug renaissance of the 19th century, attributed to the large production of these magnificent yet humble works of art. Here in the west, we have nicknamed the rugs of this region as Samarkand rugs due to the fact that most designs were passed from one oases to the next. Most Samarkand rugs were made in gallery sizes with a wool pile (few with silk) and have been regarded as the "darlings" to collectors and the decorative trade. 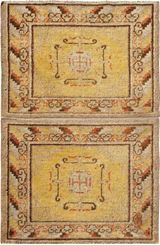 ANTIQUE SILK SAMARKAND 11'6" x 7'3"
OLD SAMARKAND 9' 2" x 18' 0"
OLD SAMARKAND 8'7" x 5'8"
ANTIQUE SAMARKAND 8'3" x 15'4"
ANTIQUE SAMARKAND 8' 2" x 15' 6"
ANTIQUE SAMARKAND 8' 0" x 15' 5"
FINE ANTIQUE SAMARKAND 7'8" x 14'2"
ANTIQUE SAMARKAND 7'1" x 13'10"
ANTIQUE SILK KASHGAR 7' 0" x 14' 3"
ANTIQUE SAMARKAND 7'0" X 13'8"
ANTIQUE SAMARKAND 7' 0" x 14' 0"
ANTIQUE SAMARKAND 7' 0" x 13' 5"
ANTIQUE SAMARKAND 6' 10" x 13' 9"
ANTIQUE SAMARKAND 6' 8" x 13' 3"
ANTIQUE SAMARKAND 6' 8" x 13' 4"
OLD SAMARKAND 6' 8" x 13' 0"
ANTIQUE SAMARKAND 6'8" x 12'6"
ANTIQUE SAMARKAND 6' 7" x 13' 0"
ANTIQUE SAMARKAND 6' 7" x 12' 8"
ANTIQUE SAMARKAND 6' 7" x 13' 1"
ANTIQUE SAMARKAND 6' 6" x 12' 4"
ANTIQUE SAMARKAND 6' 5" x 12' 8"
ANTIQUE SAMARKAND 6' 3" x 12' 6"
ANTIQUE SAMARKAND 6' 3" x 12' 4"
OLD SAMARKAND 6' 3" x 12' 1"
ANTIQUE SAMARKAND 6' 2" x 10' 9"
ANTIQUE SAMARKAND 6' 1" x 11' 0"
ANTIQUE SAMARKAND 6' 1" x 11' 6"
ANTIQUE SAMARKAND 6' 1" x 11' 1"
ANTIQUE SAMARKAND 6' 0" x 10' 8"
ANTIQUE SAMARKAND 6' 0" x 11' 6"
ANTIQUE SAMARKAND 6' 0" x 11' 1"
ANTIQUE SAMARKAND 6' 0" x 11' 2"
ANTIQUE KHOTAN 6' 0" x 10' 6"
ANTIQUE SAMARKAND 6' 0" x 11' 8"
ANTIQUE SILK SAMARKAND 6'0" X 9'5"
ANTIQUE SAMARKAND 6'0" X 12'0"
ANTIQUE SAMARKAND 6'0" X 9'3"
OLD SAMARKAND 5' 10" x 11' 2"
ANTIQUE SAMARKAND 5' 10" x 11' 0"
OLD SAMARKAND 5' 9" x 11' 5"
ANTIQUE SAMARKAND 5'10" x 12'2"
ANTIQUE SAMARKAND 5'8" x 10'0"
ANTIQUE SAMARKAND 5' 8" x 11' 0"
ANTIQUE SAMARKAND 5' 6" x 10' 10"
ANTIQUE SAMARKAND 5'6" x 11'0"
ANTIQUE SAMARKAND 5' 2" x 7' 8"
OLD SAMARKAND 5' 1" x 9' 7"
ANTIQUE SAMARKAND 5' 0" x 7' 0"
ANTIQUE SAMARKAND 4' 11" x 8' 9"
ANTIQUE SAMARKAND 4' 10" x 9' 2"
ANTIQUE SAMARKAND 4' 10" x 8' 6"
ANTIQUE SAMARKAND 4' 10" x 7' 0"
ANTIQUE SAMARKAND 4' 10" x 9' 4"
ANTIQUE SAMARKAND 4' 9" x 9' 0"
ANTIQUE SAMARKAND 4' 8" x 9' 0"
ANTIQUE SAMARKAND 4' 8" x 9' 3"
ANTIQUE SAMARKAND 4' 8" x 9' 2"
ANTIQUE SAMARKAND 4' 7" x 8' 7"
ANTIQUE SAMARKAND 4' 7" x 8' 5"
ANTIQUE SAMARKAND 4' 7" x 7' 0"
ANTIQUE SAMARKAND 4' 6" x 7' 9"
ANTIQUE SAMARKAND 4' 6" x 8' 3"
ANTIQUE SAMARKAND 4' 6" x 9' 4"
ANTIQUE SAMARKAND 4' 5" x 8' 8"
ANTIQUE SILK SAMARKAND 4' 5" x 7' 0"
ANTIQUE SAMARKAND 4' 2" x 8' 8"
ANTIQUE SAMARKAND 4' 2" x 8' 4"
ANTIQUE SAMARKAND 4' 0" x 9' 0"
ANTIQUE SAMARKAND 4' 0" x 7' 5"
ANTIQUE SAMARKAND 4' 0" x 8' 1"
ANTIQUE SAMARKAND 3' 9" x 13' 10"
ANTIQUE SAMARKAND 3' 7" x 13' 10"
ANTIQUE SAMARKAND 3' 5" x 11' 3"
OLD SAMARKAND 3' 1" x 6' 10"
ANTIQUE SAMARKAND 3' 0" x 8' 8"
ANTIQUE SAMARKAND 2' 9" x 7' 0"
ANTIQUE SAMARKAND 2' 7" x 8' 9"
ANTIQUE SAMARKAND 2' 6" x 4' 6"
ANTIQUE SAMARKAND 2' 6" x 4' 3"
ANTIQUE SAMARKAND 2' 5" x 3' 8"
ANTIQUE SAMARKAND 2' 5" x 4' 4"
ANTIQUE SAMARKAND 2' 4" x 2' 4"
ANTIQUE SAMARKAND 2' 3" x 4' 8"
ANTIQUE SAMARKAND 2' 3" x 4' 0"
ANTIQUE SAMARKAND 2' 2" x 6' 6"
ANTIQUE SAMARKAND 2' 1" x 4' 4"